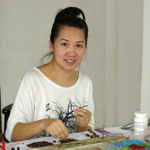 Jewelry artisan Sirada designs an alluring bracelet. Threaded by hand on stainless steel strands, it meets smoky quartz, citrine, quartz and glittering glass beads. The bracelet wraps about the wrist for a custom fit. 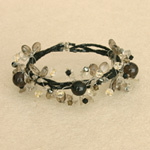 Materials: Smoky quartz, citrine, quartz, glass and stainless steel.